Topic Categories Israel “Illegal” By Whose Stupid Law? When you read accusations that Israel is so-called “illegally occupying”, demand to know “illegal” by whose stupid law that’s defined. Bear in mind two other stupid, but equally genocidal, man-made “laws”: British and Nazi. 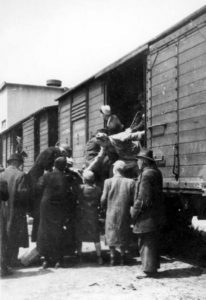 The British “White Paper” of 1939 ordered the ports of British-occupying Palestine closed and “warned any Jews who might try to evade extermination at Nazi hands by sneaking into the Holy Land, that they would be treated as enemies of the Crown.” That is, any attempt to survive by escaping sure death at the hands of the Nazis – any Jewish attempt to save one’s own life! – by trying to return to their God-given homeland, by British law, was considered “illegal”. “[T]he Germans go to fantastic trouble to make themselves truly believe what they are saying. The verbal acrobatics are played out. Basis: In order to live in the ghetto, one must break the law. Therefore, everyone who is alive is a criminal in the German lexicon and can legally be executed. Incredible? More ‘proof’ of the German case: Special SS film units have entered the ghetto. They film the delousing sheds. Have you ever seen a man fifty pounds underweight, freezing cold, and hairless? German narration shows this is a ‘sub-human’ disease carrier, and the appearance portrays just that. Bearded rabbis are forced to pose in the warehouses at Transferstelle beside tons of food while the narration ‘proves’ how the Gestapo located secret caches which these old bearded Jews hoarded while their neighbors starved” (Mila 18, Part II, Chapter 30, pp. 280-281). Am Yisrael lives in Eretz Yisrael by the right given by God in His ultimate Law, the Torah. All goyim who make up laws to say otherwise, can go take a hike. Am Yisrael Chai!! !